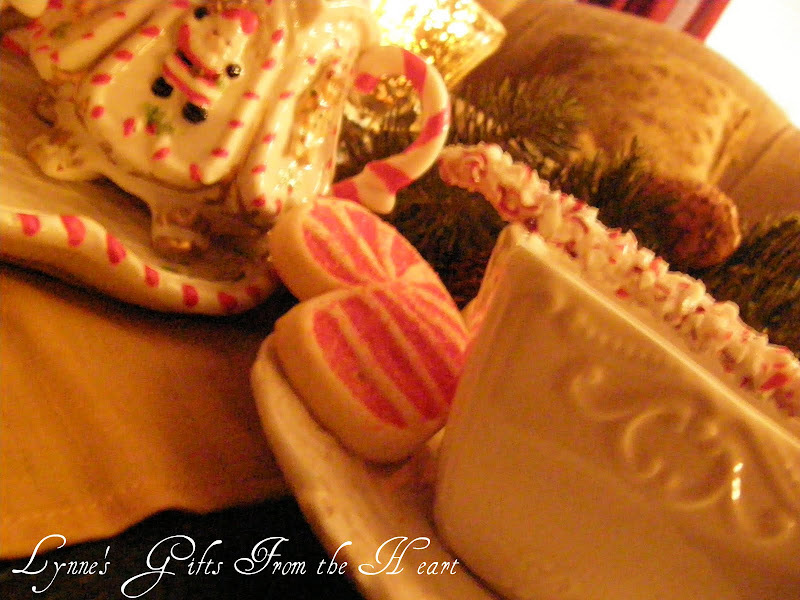 Lynne's Gifts From the Heart: Cinnamon Coffee Anyone??? I see you spotted the cookies .. yes, please help yourselves. 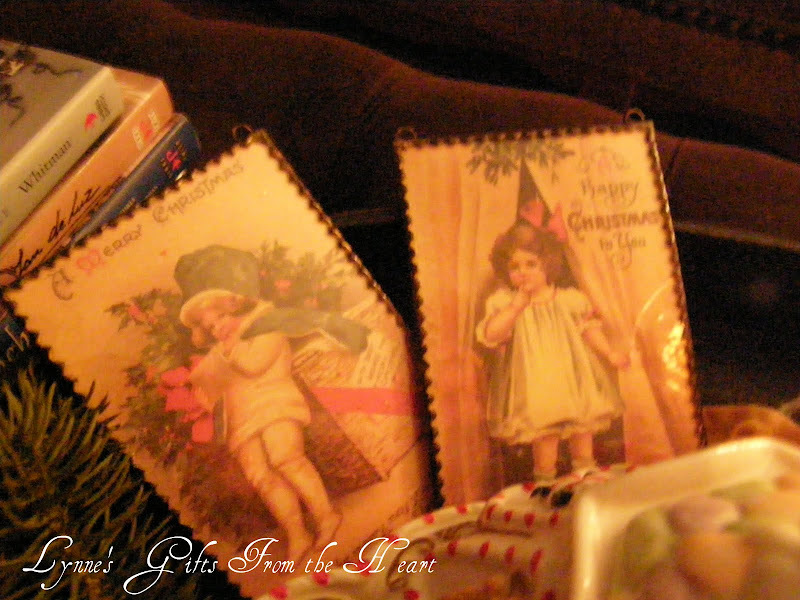 A few vintage Christmas cards. With twinkling Christmas lights and the sounds of Christmas music in the background the stage is set for a nice long visit. Yes, feel free to take another. Santa won't miss a little 'ole cookie. 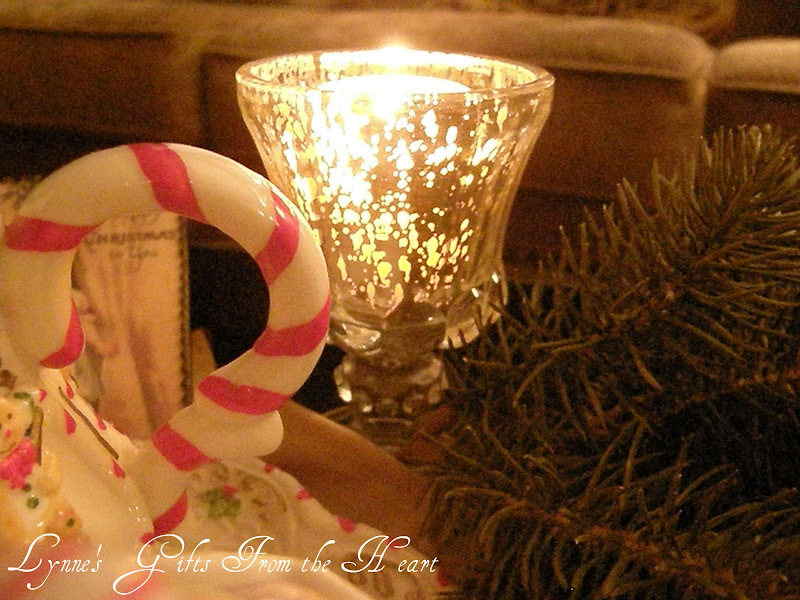 A mercury glass candle holder puts off the perfect glow. 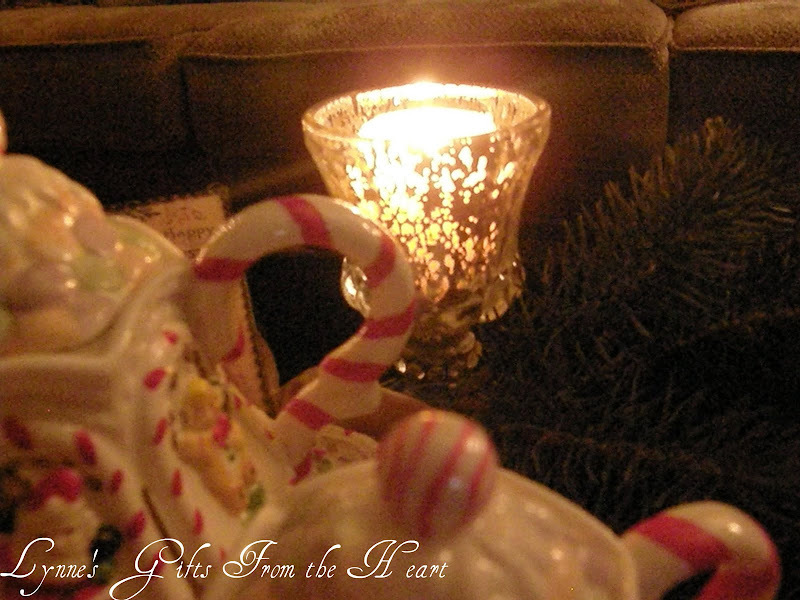 A bit of the candle glow and a touch of the Christmas greens. We're so glad you stopped by for a spot of tea. We sure enjoyed your visit. Be sure to swing over to Susan's to see each of those participating in these week's Tablescape Thursday event. I know we're in for a treat. I know I'm looking forward to it. I'll see you there. 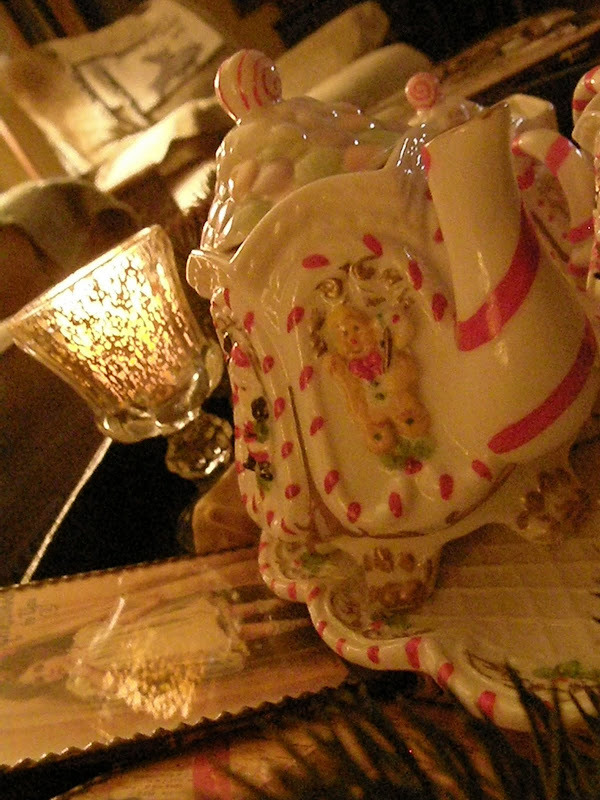 I have been looking for weeks for a Christmas teapot. I even checked CB but none. Guess I won't find one this year. But your set is precious! Well, I'd love love to pop in for a cup of tea with you, Lynne......it all looks so inviting and cherry. That tea/coffee set is beautiful!! I love the vintage cards (charms). Did you make those. I am looking forward to working on my soldering skills after the holidays. Thank you for the tea and cookies,I enjoyed my visit. I love your teaset! I wish I had one of those yummy cookies. 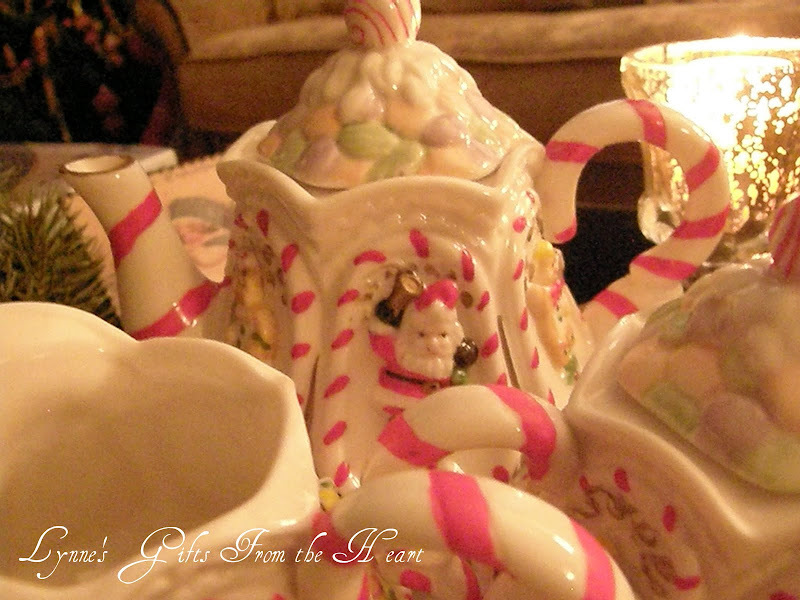 Love your tea set!! Great tablescape!! 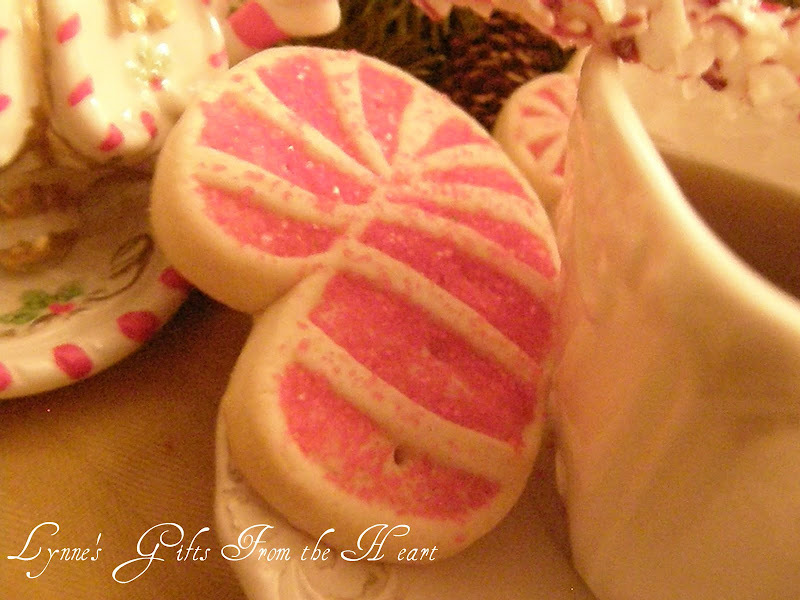 I love peppermint tea and I love sugar cookies...and the candycane cookie looks so very yummy!! What an adorable tea pot set. Very dainty, too. You sure know how to warm a girl up after being out int he cold. Its always a treat here! I love the tea setting! 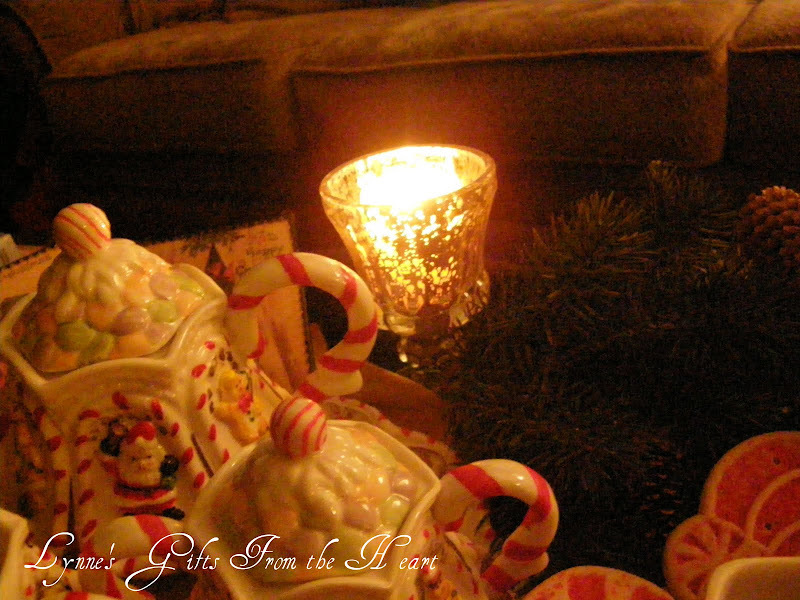 So Christmassy and feminine at the same time! Lynne What a lovely tea party you have created! 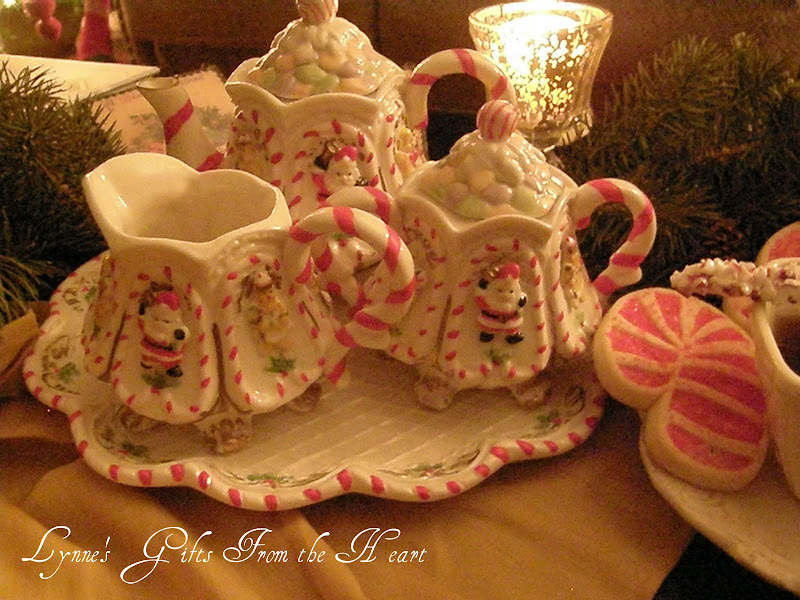 Love the tea set!! 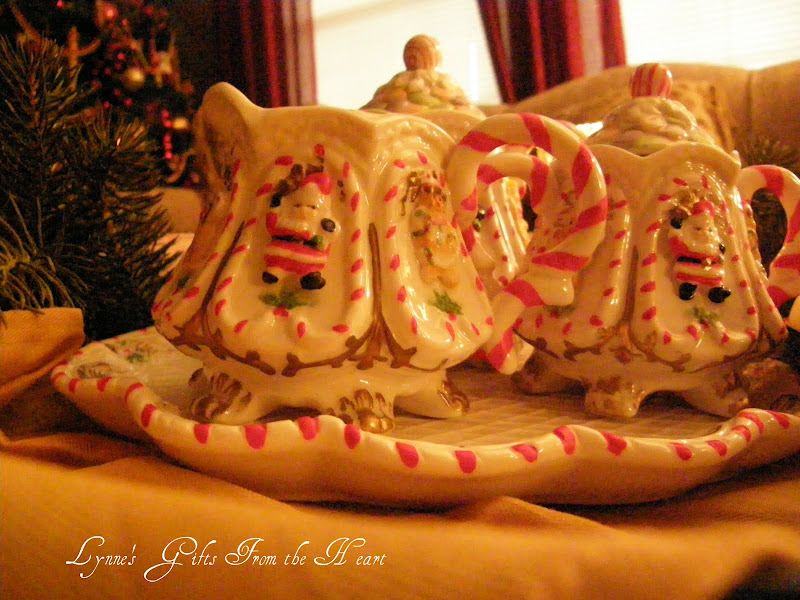 Darling tea set. Have a great day! 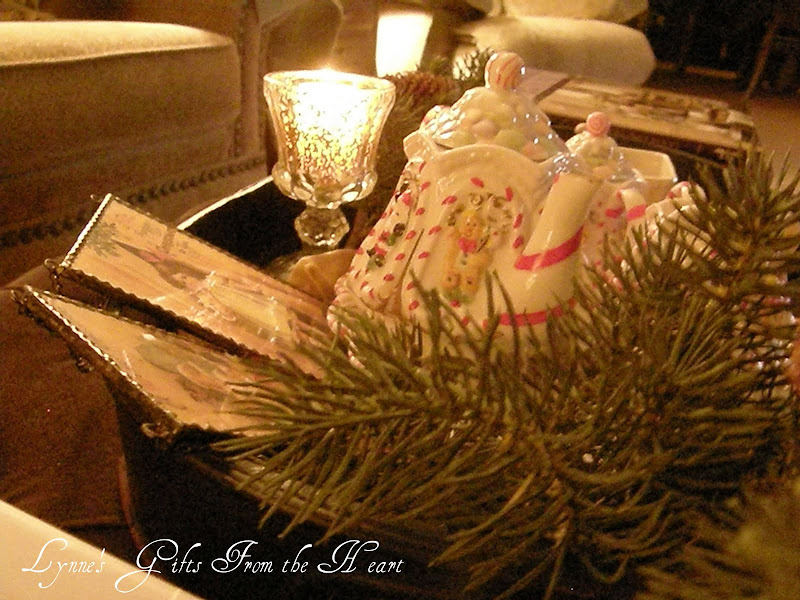 Thank you for inviting us to Christmas tea! What a beautiful set. 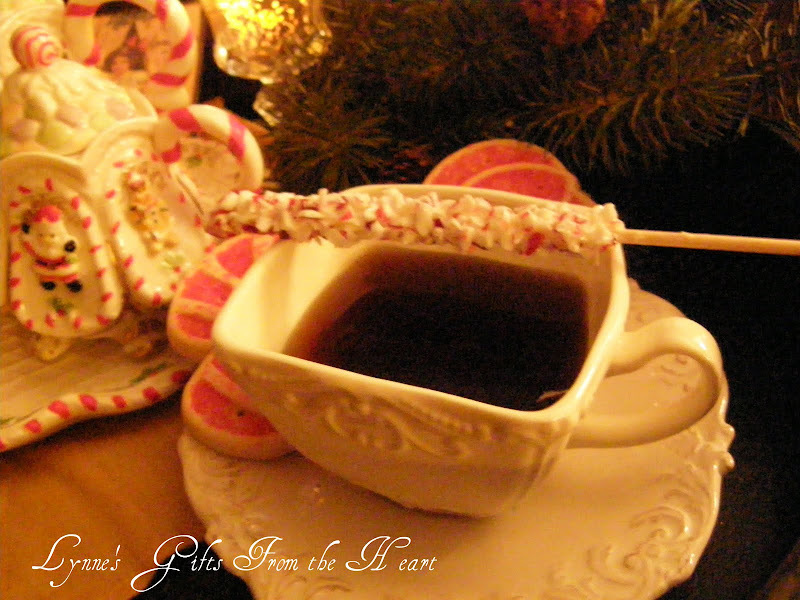 What wonderful stir sticks as well! 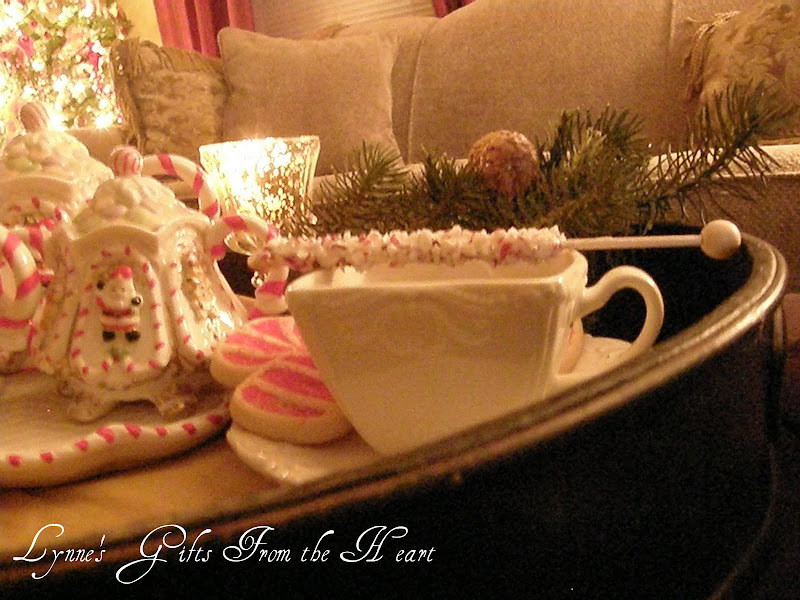 Such a cute little set and the peppermint stirrers are so cute. I need to hang out at CB more often. Merry Christmas.